Draw date: March 14, 2016 at 3:30 p.m.
Prizes may be claimed at St. Mary’s Academy, 550 Wellington Crescent. (Enter SMA grounds via Stafford Street. Enter Administration Building through main doors that face Wellington Crescent). If you have questions regarding picking up your prize, please contact Brenda Van Raes at 204-478-6042 or bvanraes@smamb.ca. 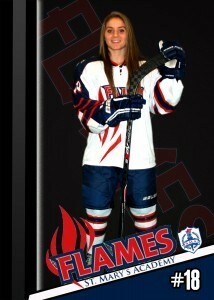 Congratulations to the Flames Prep team on bringing home Bronze from the FWSSC. The Flames came away with a 6-0 win over the Balmoral Hall Blazers to claim Bronze. St. Mary’s Academy is proud to host the 4th Annual Female World Sport School Challenge (FWSSC) at the MTS Iceplex from March 10-13, 2016. This Hockey Canada initiated tournament features ten top female hockey teams from across North America. They will compete for the gold medal, as National Champions. All games will be played at the MTS Iceplex, a Hockey Canada Centre of Excellence designated facility. The 2016 FWSSC features the following ten teams: Balmoral Hall Blazers, Shaftesbury Titans and St. Mary’s Academy Flames. They will be joined by the Banff Hockey Academy Bruins, Notre Dame Hounds, Pursuit of Excellence, Rothesay Netherwood Riverhawks, Shattuck-St. Mary’s Sabres U-19, St. Frances Xavier Northern Alberta Xtreme and the Vancouver Hockey Academy Greyhounds. Congratulations to Flames grade 12 Forward Cecilia Lopez on the official news of her commitment to Ivy League Dartmouth University Big Green for the 2016-17 season. Way to go, Cecilia! 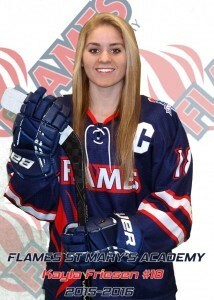 Senior Flames centre and team captain Kayla Friesen will represent Team Canada at the IIHF Ice Hockey U18 Women’s World Championships. The 2016 event will take place January 8-15, 2016 on home ice in St. Catharines, Ontario. It begins with a tilt against Russia on Friday, January 8 at 7:30 p.m. ET, and will also play the Czech Republic before a showdown with last year’s gold-medallists from the United States. 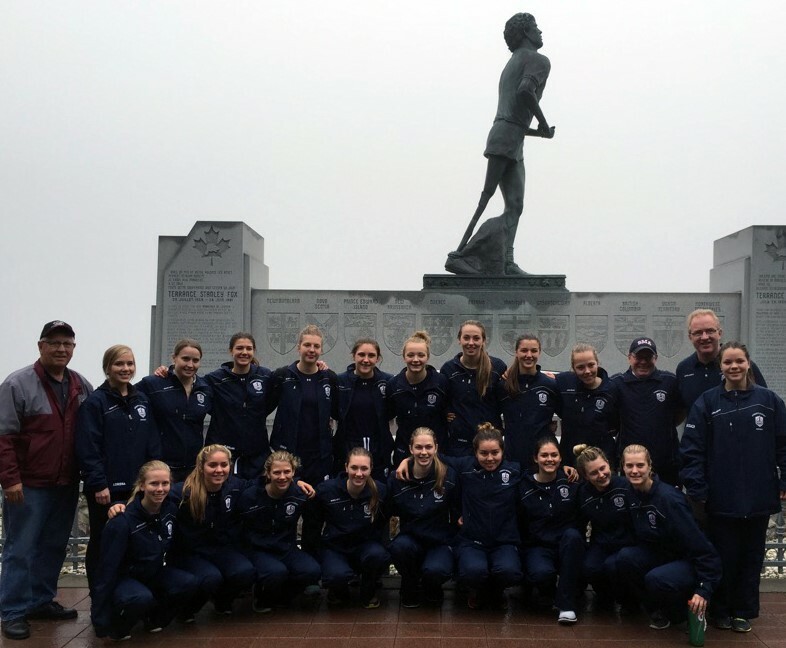 The SMA hockey community sends congratulations to our four Flames; Tory Micklash, Kayla Friesen, KK Thiessen and Holly Reuther for representing the school and province so well as Silver Medalists at the 2015 National Women’s Under-18 Championships, which were held in Huntsville, ON from November 4 – November 8, 2015. Hats off to Head Coach Jordan Sobkowicz and assistant coaches Jeff Sveinson and Sarah Zacharias and all players, staff and supporters of Team Manitoba for this wonderful achievement! 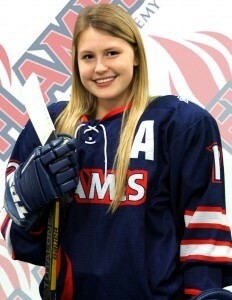 Congratulations to Flames grade 12 Assistant Captain/Forward Morgan Burr on the official news of her commitment to the University of Alberta Pandas for the 2016-17 season. Way to go, Morgan! On November 1, 2015 the SMA Flames Prep Team enjoyed a great day on and off the ice as they were invited back for a second year in a row to be part of a special Female Hockey Fights Cancer weekend in Manitoba. Competing for the Dale Hughesman Cup, in honour of the late Winnipeg businessman who was very active in minor hockey, the Flames came away with a hard-earned 4-1 win up at the Selkirk recreation Center. More importantly, however, was the fact that $18,000-plus dollars will be going to the CancerCare Manitoba Foundation as a result of an entire weekend of fundraising involving a growing number of participants from various levels of local minor and collegiate hockey. Hats off from all of us at SMA to event organizers Dennis and Melanie Park of Selkirk and to the Avros and their Head Coach Ashley van Eggelen and everyone else who gave their support this weekend to such a worthwhile cause. A sunny, smooth flight out west provided a great omen for a great Thanksgiving weekend of hockey and hospitality courtesy of our friends and colleagues at St. Francis Xavier Catholic School in Edmonton. A Friday morning colossal battle with our hosts at the venerable old Clare Drake Arena on the campus of the University of Alberta resulted in a 4-3 win for the Flames. The balance of the day was highlighted by a festive Thanksgiving dinner hosted by St. FX and a tour of their sprawling, modern campus in northwest Edmonton. Immediately after, our Flames enjoyed several hours at nearby West Edmonton Mall to cap off a great start to the weekend. Hockey dominated the next two days as we played three more games of full 3 period, 20 minute matches. Game two Saturday morning was an 11-1 win over local AAA Edmonton Thunder, followed by a spirited and lively return match with St Francis, this time our Flames prevailed with a well-deserved 4-0 shutout win. Sunday was the final match of the weekend, a much-anticipated affair against former Flame Jenna Thompson ’13 and her Grant MacEwan Community College (Edmonton ACAC) Griffins at the posh Leduc Recreation Center. Final score was 2-1 in our favor to close out an excellent weekend all around. Special thanks go to Leah Copeland and the parents, players and all involved at St. Francis Xavier in hosting us this weekend and to Howie Draper and his amazing staff at the University of Alberta for all their help from skate sharpening to helmet adjusting and everything else in between that made this such a memorable time for us at SMA. The U-18 Team Manitoba (POE) roster for 2015-16 was named on October 5 and congratulations go out to four of our Flames who cracked the final roster. The team has twenty names with two goaltenders, six defence, and twelve forwards. Flames gr 12 captain/forward Kayla Friesen and goalie Tory Micklash are joined by two grade 11 assistant captains, Kyra (KK) Thiessen on the blueline and Holly Reuther up front. Team Manitoba will be competing at the U-18 National Championships November 4-8 in Huntsville Ontario. This tournament includes eight provincial and regional teams, including Alberta, Atlantic, British Columbia, Manitoba, Ontario Blue, Ontario Red, Quebec and Saskatchewan. Special congratulations go out to Flames grade 12 captain/forward Kayla Friesen, goalie Tory Micklash and grade 11 assistant captain, Kyra (KK) Thiessen on the official news of their commitments to college/university hockey. Friesen will take her talents and leadership next fall to DI St. Cloud State University in Minnesota, Micklash to the University of British Columbia (CIS) where she joins SMA alum Maddy Patrick ’14 next fall, and Thiessen joins fellow SMA alum blueliner Callie Paddock ’14 at DI Mercyhurst University in Erie, Pennsylvania in two years time. 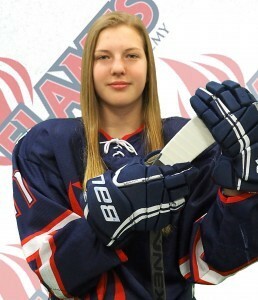 Incoming grade 12 veteran Kayla Friesen is the third Flame in three consecutive years (joining alumni Danielle Krzyszczyk and Christian Higham) to make the National Team Canada Women’s Under-18 summer Team. Her 2015 squad plays three exhibition games vs the United States in Lake Placid, N.Y. August 20-23. Congratulations, Kayla!